And someone had better warn Rob…I think I might be falling in love with my pressure cooker. Cook the rye berries and salt according to your pressure cooker directions. (I used the water and timing guidelines for brown rice and my rye berries came out perfectly cooked.) If you don't have a pressure cooker, combine the rye berries, salt and 3 1/2 cups water in a heavy pot. Bring to a boil, lower heat, cover and let simmer for 1 hour, or until tender. Meanwhile, preheat the oven to 400°F. Place the pumpkin on a sheet pan and toss with the grapeseed oil. Roast for 20 minutes, stirring halfway through baking. In a small bowl, whisk together the rice vinegar, miso paste and maple syrup until smooth. Slowly whisk in the walnut oil. Place the kale in a large bowl and toss with 2 tablespoons of the dressing. Massage the dressing into the kale, until the leaves are soft and pliable. 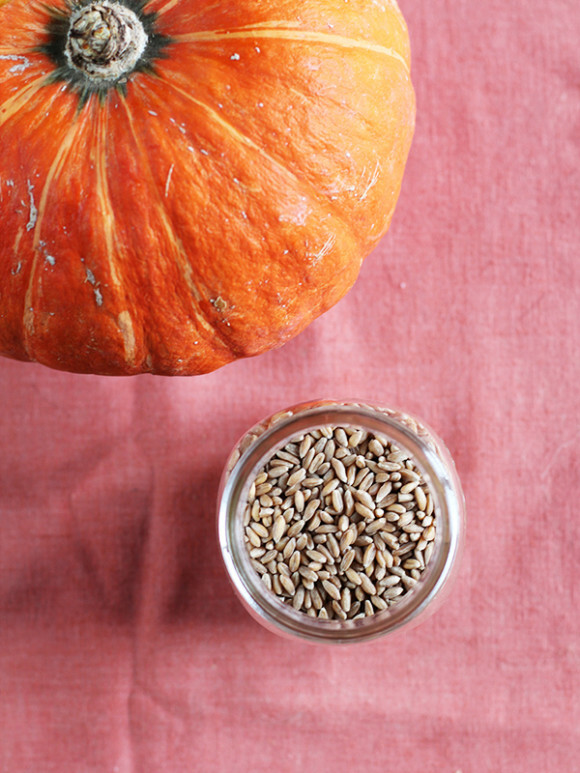 Add the cooked rye berries, the pumpkin and the remaining dressing and toss to coat. 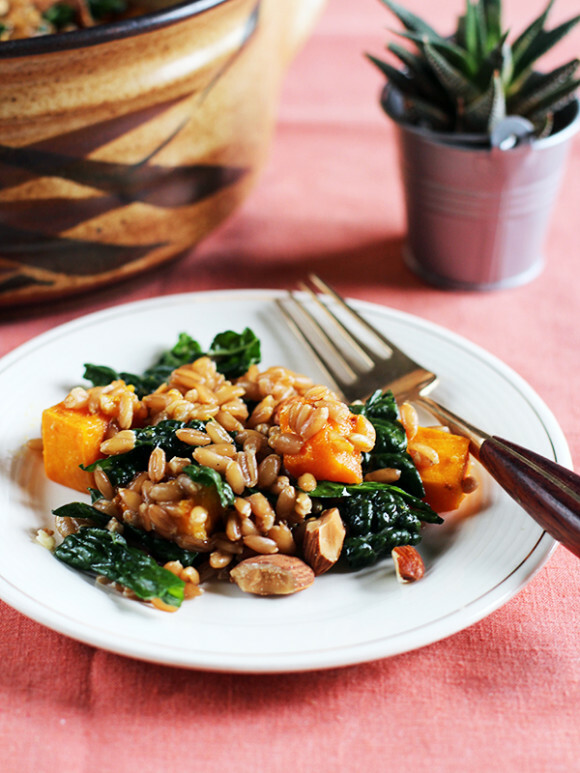 Sprinkle the almonds over the top and serve warm or at room temperature. • You can use another whole grain in place of the rye berries, but I think another chewy grain works best, such as barley, farro or wheat berries. • Grade B maple syrup has a more prominent maple flavor than Grade A, but either one can be used in a pinch. • This salad keeps well in the refrigerator for up to 3 days. • I don't really like dried fruit in salads (strange, I know), but if that's your thing, dried cranberries would probably be a nice addition. 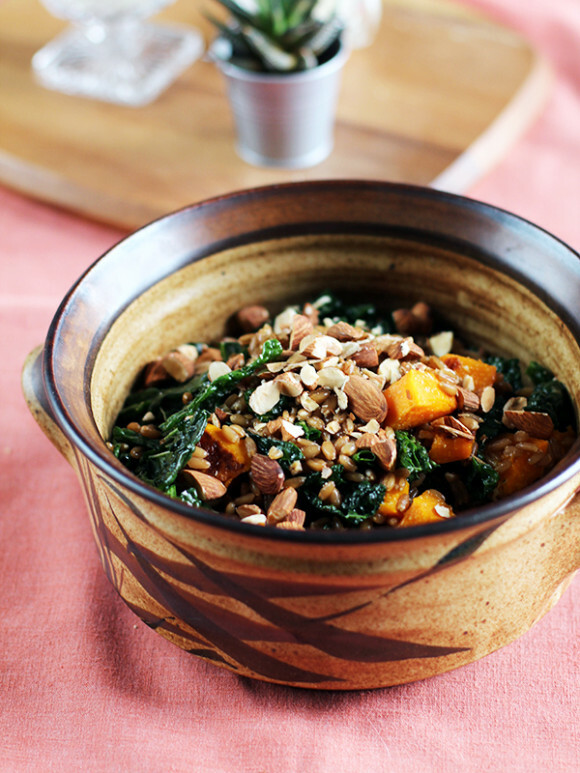 Beautiful photography Anjali, I’m definitely going to have to pass this recipe on to my sister, because its right up her alley – she loves kale, Asian food, and she’s got a bumper crop of squash, including pumpkins, coming in her garden! Thanks, that’s so interesting — I’ll definitely try it! I love how you say “massage” the dressing into the kale. I use my hands quite often to blend ingredients (originally learned this in India) and the tactile really adds a lot to the experience of cooking–not to mention the oils being good for my skin. I agree — it makes me sad when people say they don’t like touching their food while they cook. Okay, you’ve convinced me. Was trying to pare down the kitchen tools, but pressure cooker will make an appearance on the Christmas list this year! You won’t be sorry! I’m thinking about giving away my slow cooker (which I only use for beans anyway) so I have more cupboard space for mine. Brown rice in 20 minutes?! Now I want a pressure cooker! If only I had a place to store it. My KitchenAid mixer is already in my closet next to my hamper. Might have to go the stove route to cook the rye for this dish. 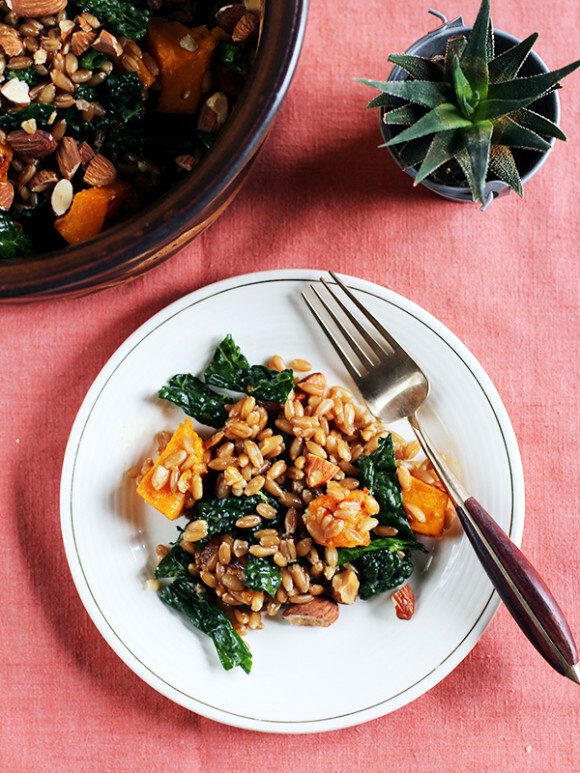 It looks like an amazing fall meal! Yum, everything looks lovely. I am taking a course on line called “whole food kitchen” – and love learning about ways to add more plant based cuisine to my diet. I love slow cookers, pressure cookers and anything that is prepared with time and love. so nice to find your blog Anjali 🙂 and I heart my pressure cooker too. Do you have any recommendations for good/great pressure cooker cookbooks?